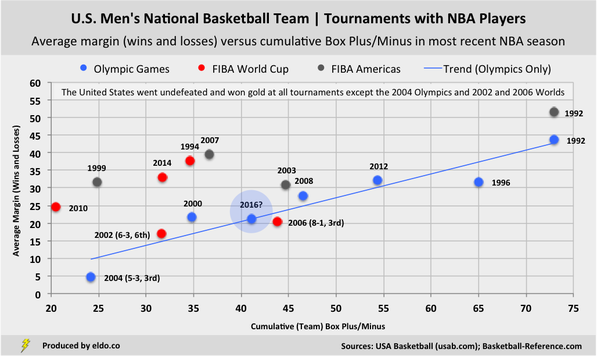 As the 2016 Summer Olympics in Rio de Janeiro approach, American basketball fans are experiencing the now quadrennial tradition of wondering (and worrying) whether the United States men’s Olympic basketball team might be vulnerable. Alas, things weren’t always this way. In 1989, the International Basketball Federation (FIBA) voted to allow NBA players to compete in international competitions. Three years later, USA basketball debuted the "Dream Team" – a roster of NBA superstars – which swept its way to gold at the FIBA Americas Championship and Barcelona Olympics, defeating awestruck opponents by an average of 47 points in the two competitions. The Americans' breaking point came at the 2002 Worlds in Indiana, where Team USA lost three games and finished sixth. Two years later, the U.S. lost three games at the Athens Olympics and won bronze. And two years after that, they lost a semifinal at the Worlds in Japan and took home bronze again. A new national team program and renewed commitment from top players finally returned the USA to gold at the 2007 Americas, 2008 and 2012 Olympics, and 2010 and 2014 Worlds. The 2016 Olympics mark the sixteenth time that the U.S. men’s national basketball team is comprised of NBA players (seven Olympics, five Worlds, and four Americas). And if you’ve been paying attention to “who’s in and who’s out”, it’s hard not to conjure up at least some fearful memories of the goldless mid-2000s, when instead of Jason Kidd, Kobe Bryant, Tracy McGrady, Kevin Garnett, and Shaquille O’Neal (all non-participants), the 2004 Olympic team featured Stephon Marbury, Allen Iverson, Richard Jefferson, and Lamar Odom in its starting five. Notable absences from this year’s edition include Stephen Curry, Russell Westbrook, LeBron James, and Kawhi Leonard – the top four performers in the NBA last season in Box Plus/Minus (BPM). There’s no Chris Paul (6th in BPM) or James Harden (8th) either. So how good is the squad headed to Rio? The 2016 Rio team has a cumulative BPM of 41.1 and six players with prior experience at the Olympics, Worlds, or Americas. Both are nearly dead-on averages when compared with the other 15 teams of NBA players that USA basketball has sent to major competitions. Four of those players (DeMarcus Cousins, Kyrie Irving, DeMar DeRozan, and Klay Thompson) were together two years ago for the Worlds in Spain -- slightly better than average overall. ​How do they rank among other U.S. Olympic teams since 1992? 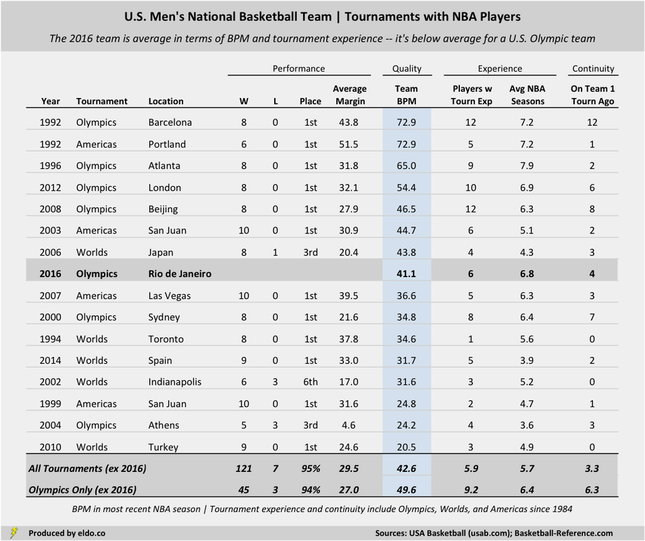 Not surprisingly, U.S. Olympic teams are typically better, more experienced, and have more continuity than U.S. teams sent to other tournaments, with an average BPM of 49.6 (2016: 41.1), 9.2 players with tournament experience (2016: 6), and 6.3 players that were together in the preceding tournament (2016: 4). 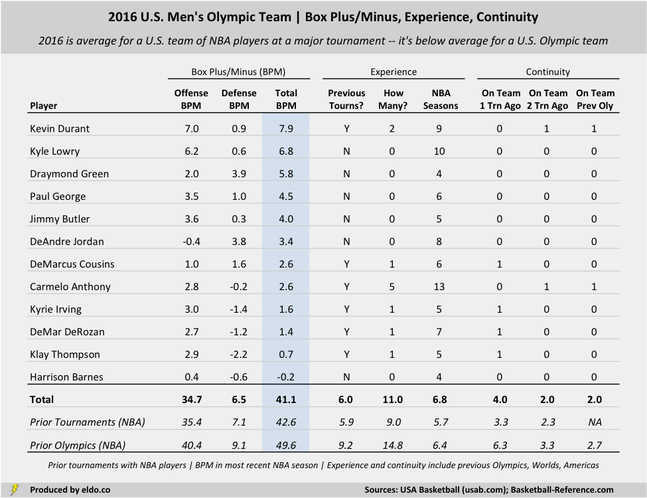 Measured against those Olympic teams, the 2016 iteration is below average, ranking fifth out of seven in cumulative BPM, sixth in tournament experience, and fifth in continuity. As you look at this chart, keep in mind that the competition at the Americas tournaments (dark gray) is inferior to that of the Worlds and Olympics (as it’s not a global tournament), and the quality of international opponents against which these U.S. teams played has almost certainly improved over time. 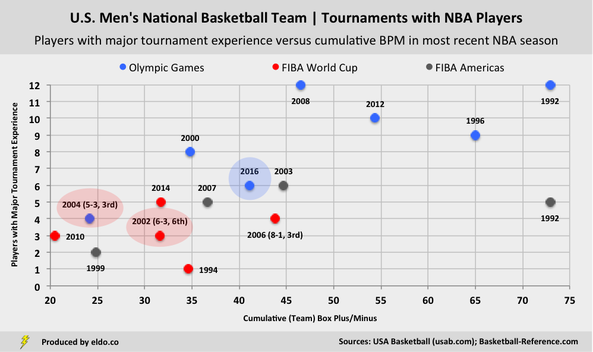 Nevertheless – and however small the sample – there is a very strong relationship between the BPM of the last six U.S. Olympic teams (in blue) and their average tournament performances. If that blue trendline were all that mattered, we'd expect the U.S. Olympic team to win by an average of 21.2 points in Rio. But it’s not the only thing that matters, and average results don’t mean much if you beat China by 31 points in group play but lose to Greece by six in the semifinals, as the similar-in-BPM (but less experienced) 2006 team did at the World Championships in Japan. 2016 is not 1992, 1996, 2008 (with its tournament experience and continuity), or 2012, but we needn’t worry like it’s 2002 or 2004 either. That leaves the Rio team right in the “we could lose a game” space, tucked between the 2000 Olympic team – which beat Lithuania by two in the semifinals and led France by four with 4:26 left in the gold medal game – and the one-loss 2006 World Championship team. The 2012 Olympic team was better and more experienced than this one, and they were tested by Lithuania in group play (five points) and Spain in the gold medal game (seven). If that loss comes – and it might – we’ll just have to hope it isn’t in the knockout round. For additional experience and continuity metrics, please see Appendix I. To view the 1992, 2004, and 2016 Olympic rosters in detail, please see Appendix II. The United States actually voted against the measure. Through 2003 known as the Tournament of the Americas. Through 2010 known as the FIBA World Championships. It will forever be impossible to write "Team USA" and not think of Emilio Estevez and the Mighty Ducks. The U.S. won gold with NBA players at the 2003 Americas in Puerto Rico. The Senior National Team program was initiated in 2005 and runs in quadrennia (2005-2008, 2009-2012, 2013-2016). The U.S. has not participated in the FIBA Americas Championship since 2007. Certain teams included a recent college player: Anthony Davis (2012 Olympics), Emeka Okafor (2004 Olympics), Nick Collison (2003 Americas), Jay Williams (2002 Worlds), Elton Brand (1999 Americas), Richard Hamilton (1999 Americas), Wally Szczerbiak (1999 Americas), and Christian Laettner (1992 Olympics and Americas). Tim Duncan was the fifth starter. LeBron James, Dwyane Wade, and Carmelo Anthony had just finished their rookie seasons and came off the bench. With the following exceptions: Derrick Rose (2014 Worlds) uses 2014-2015; Anthony Davis (2012 Olympics) uses 2012-2013; Emeka Okafor (2004 Olympics) uses 2004-2005; Nick Collison (2003 Americas) uses 2004-2005; Jay Williams (2002 Worlds) uses 2002-2003; Elton Brand, Richard Hamilton, Wally Szczerbiak (1999 Americas) use 1999-2000; Magic Johnson (1992 Olympics and Americas) uses 1990-1991; Christian Laettner (1992 Olympics and Americas) uses 1992-1993. Excluding seasons in which a player played fewer than twenty games. Bad and inexperienced teams haven’t always faltered – the 2010 World Championship team went undefeated and won gold. 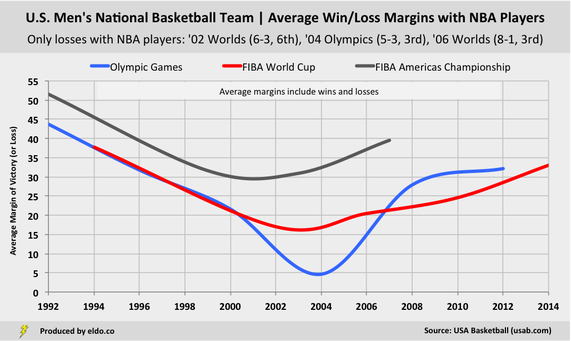 ​ The “average margin of victory” calculation includes both wins (positive margins) and losses (negative margins).